It would be less complicated if the Empire State Development Corporation (ESDC) and Atlantic Yards supporters simply professed that Atlantic Yards would have a ten-year timetable in official documents while acknowledging in public statements that the project could take much longer (as project opponent Daniel Goldstein pointed out in comments at the ESDC board meeting last Thursday). 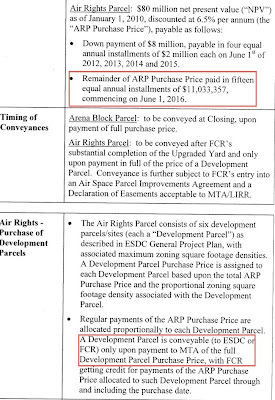 However, as Develop Don't Destroy Brooklyn has pointed out, the revised deal for the Metropolitan Transportation Authority's Vanderbilt Yard gives the FCR 22 years, until 2030, to pay for the railyard, and only after payment would the six development parcels be conveyed to the developer. In other words, the only way to meet the ten-year timetable would be for Forest City Ratner to speed up payments. 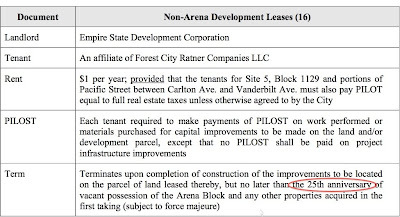 In March 2008, I reported that the State Funding Agreement gave the developer six years to build the arena and 12 years to build Phase 1 before penalties kicked in, and that the clock didn't start ticking until the delivery of property via eminent domain. The Arena Block Interim Lease and the Site 5 Interim Lease will expire upon the last remaining parcel demised thereunder becoming subject to a development lease with FCRC (as further described in this Notice), and in any event, no later than the twelfth (12th) anniversary of vacant possession of the Arena Block and any other properties acquired in the first taking being delivered to affiliates of FCRC, subject to extension for force majeure events or payment of liquidated damages. 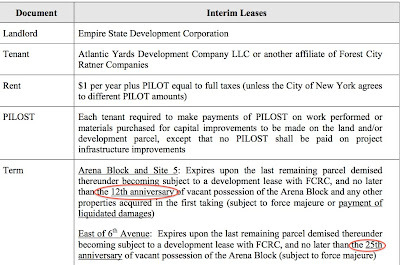 The Interim Leases for the Project site east of 6th Avenue will expire upon the last remaining parcel demised thereunder becoming subject to a development lease with FCRC or its affiliates (as further described in this Notice), and in any event, no later than the twenty-fifth (25th) anniversary of vacant possession of the Arena Block and any other properties acquired in the first taking being delivered to affiliates of FCRC, subject to extension for force majeure. So that's why Bruce Ratner told the Daily News it could take 25 years. A Response to Comments document distributed to the ESDC board last Thursday dodged the question. The 10-year schedule set forth in the FEIS approved by ESDC in 2006 and the Technical Memorandum is based on the assumption that FCRC will proceed with substantial construction promptly after closing and continuously pursue construction to completion of the Project. Those assumptions are reasonable, since: 1) FCR has made a substantial investment to date in acquisition costs, soft cost and preliminary construction activities, and can be expected to seek to recognize a return on those expenditures as soon as possible; and 2) it is reasonable to expect that the market will absorb the additional residential units constructed by FCR in accordance with the schedule. The phased condemnation allowed by the MGPP is intended to facilitate the commencement of the Project and does not change the 10-year construction schedule. Though the ESDC thinks a ten-year period is reasonable, experts disagree. And that means that the claimed project benefits would come much more slowly, and that claimed blight would persist rather than be removed.